The fourteenth century temple of Wat Suan Dok is located just west of the old city walls on Suthep Road. The temple was built by King Keu Na of Lanna for a revered priest visiting from Sukhothai as a place for the monk to spend the rains retreat. The name of the temple roughly translates to "field of flowers." The gilded pagoda and the massive open-air prayer hall. There are several unique features to this temple that you won't see in just about any other wat around Chiang Mai, or even elsewhere in Thailand. One of the first is the temple's large wiharn, or prayer hall. The chapel is unusual not only for its size, but also the fact that it is open on the sides rather than being totally enclosed. 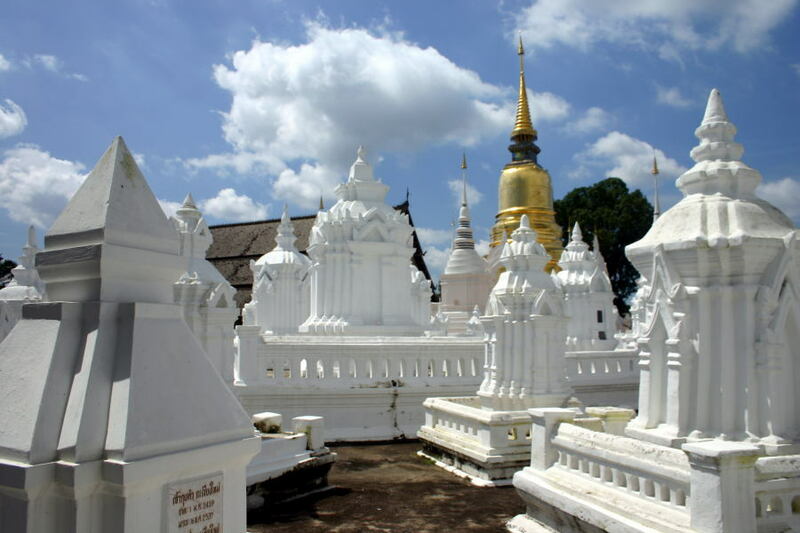 Directly west of the wiharn are several large pagodas, called chedi in Thai. The largest of these is the center of another unusual story. Pagodas will almost always contain Buddhist relics. The biggest and most important chedis will contain a relic of the Buddha himself. In the case of Suan Dok, the largest pagoda contained a relic that reputedly self-replicated. One of the relics was placed on the back of a royal white elephant, which was then allowed to wander where-ever it wanted to go. The elephant eventually came to a stop, and actually died, on Suthep mountain. Chiang Mai's most revered temple, Wat Prathat Doi Suthep, was built on the exact spot where the elephant came to rest. Reliquaries of the past rulers of Chiang Mai. Next to the pagoda is a veritable forest of ornate white-washed reliquaries. 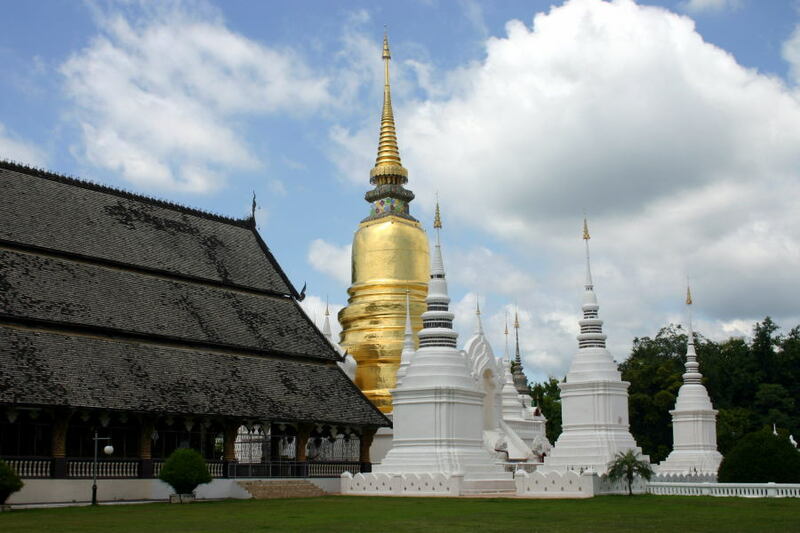 This "city of the dead" houses the cremated remains of the rulers of Chiang Mai. Walking among these elaborate monuments, you could easily be reminded of the famous above-ground cemeteries of New Orleans. Wat Suan Dok is also a temple where you can try to learn more about Buddhism, through their "monk chat" program. At certain times, and on certain days of the week, you can talk with a Buddhist monk. This program is in part a chance for monks to practice their English skills, so don't expect fluent conversation. Wat Suan Dok is located on Suthep road, next to the Hill Tribe Products Promotion Center.